It’s official! I’m working on a Johannesburg book to be released in October 2018. The book is loosely based on some of the work on this blog and a whole lot more. It’ll feature some unique and rare photos uncovered from various archives with accompanying research. The design, layout and new photograpy will be done by my super-talented wife, Fiona O’Connor. Thanks to Pippa Parker at Penguin Random House SA for the opportunity and special thanks to all the readers and supporters of this little blog. Work on the book will take up most of my spare time until April 2018, but I will be working on the Fordsburg post for later in the year as well as adding and updating the older posts with new information and archive photos. On a sad note, I recently learned of Val Hammerton’s passing. 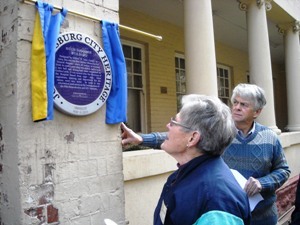 Val was a veteran reasearcher and tour guide with the Johannesburg Heritage Foundation. I’ve been on several of her tours over the years and will miss her vintage dress-ups at the annual heritage day events. R.I.P. Val. 10 Aug	This entry was published on August 10, 2017 at 11:51 am. It’s filed under Johannesburg and tagged Johannesburg Heritage Foundation, Penguin Random House. Bookmark the permalink. Follow any comments here with the RSS feed for this post. Good man! I’ll take a copy for sure. It’s people like you who contribute so much to our civilization. Congratulations! I love your blog and I will definitely be in line for a copy! Thanks very much for the update. I hope you may be able to use one or two of my photos eventually. Sorry to hear about your pal Val. Thanks Peter! I may have some pics for you from that tour. The railway archive were putting something together that followed the procession from town through Clarendon and beyond. Congratulations on the book deal! I look forward to its appearance. Is it possible to pre-order? Hi Jane, not yet but please follow the blog for info. I’ll always post any updates here first. I imagine any pre-ordering will only be available once the book goes to print and the relevant ISBN numbers have been allocated. I’ll be buying a copy. Or two. Thanks Jack! I’ll announce the official launch date closer to the time. Thanks Olaf! I’ll send out a notice closer to the time as to which countries the publisher can send books to (I understand it’s all over the world). Perhaps a pre-order or something like that. I love your website and look forward to news about the publication date of your book. Hi Marc – Can we pre-order yet?